Ice cream is a frozen dessert made with milk or cream along with added flavors. Fresh fruits or artificial flavorings are added to impart particular flavor to this treat. 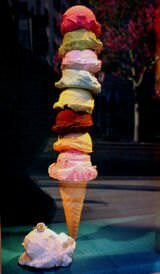 Ice creams are served in cups, cones, as sundaes and with different topping such as chocolate syrup, nuts, wafers, caramel, fresh fruits and more. Frozen yogurt is also a dessert but is made from yogurt instead of cream, and hence more tart than ice cream. Frozen yogurt is sweet a dessert - often with a hint of tartness - with flavored yogurt as its main ingredient. Other ingredients include sugar and flavoring additives. American-style ice cream, which tends to be manufactured industrially by large, commercial enterprises, contains more air, milk fat, and cream than gelato does and more frequently contains preservatives and artificial flavors. Although frozen yogurt started out with mostly fruit based flavors, the manufacturers have been coming up with innovative flavors to make it closer to ice cream. More likely to use artificial flavors and artificially-flavored candies than gelato is. Vanilla, chocolate, fruit, and nut flavors are popular. Chunks of chocolate, fruit, and nuts are common in ice cream. Because of its cultures & broken down lactose content, yogurt is easier to digest than other dairy. However, only some frozen yogurt has live cultures that help lactose intolerance; consumers should check the label before buying. Regular ice cream generally does not work for lactose intolerance. You do however get lactose free ice cream. 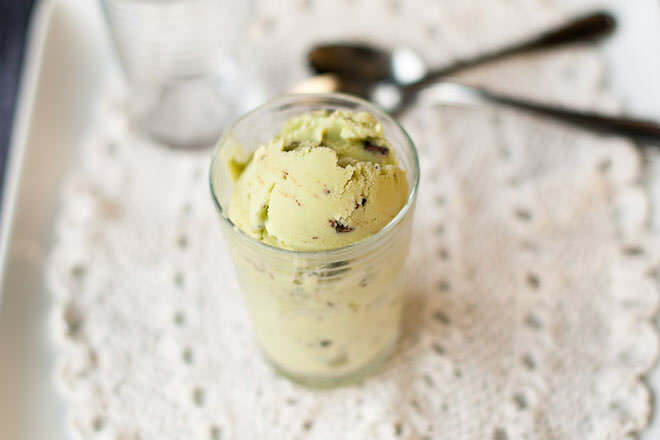 Some of the popular flavors of ice cream include, vanilla, chocolate, pecan, strawberry, Neapolitan, chocolate chip, cherry, almond, coffee and others. 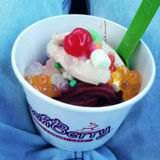 Frozen yogurt is served in different flavors as well including, vanilla, chocolate, peanut butter, berry, toffee, strawberry, and mango. The history of ice cream can be traced back to Baghdad where a form of ice cream was a popular dessert. But due credit has to be given to the Chinese who devised a way of making ice and milk mixtures. Ice cream soon found its way from China to Europe and then to the Unites States. Since then different forms of ice dessert have been made and served all over the world. Frozen yogurt was first introduced in 1970 but gained popularity in the 1980s. It is considered to be a healthier alternative to ice cream. Ice cream is made from milk fat (10-16%), milk solids, sweeteners (sugar or artificial ones), flavorings, stabilizers and water. Frozen yogurt usually contains yogurt culture, milk solids and milk fat, gelatin, corn syrup and other flavorings. 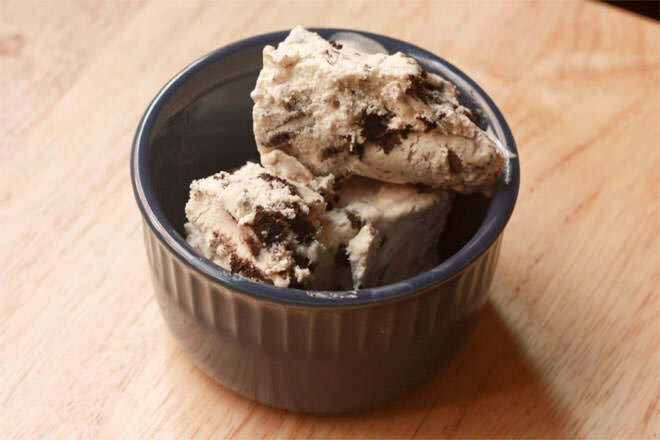 Ice cream is generally prepared in cooling vats, and the ingredients churned while it is being cooled, this prevents the formation of ice crystals and makes the ice cream creamier. Frozen yogurt can also be prepared in an ice cream machine. The trick is to incorporate air into it after all the ingredients have been mixed, and then cool it rapidly to prevent formation of ice crystals. Although both ice cream and frozen yogurt provide calcium, protein and other vitamins and minerals, there are various other health benefit of frozen yogurt. One of the ingredients of frozen yogurt is live bacterial cultures, which are good for the body’s immune system. Besides that, frozen yogurt is easier to digest than ice cream, especially in people with lactose intolerance. The fat content in ice cream is 10-18%, whereas in frozen yogurt it is lower. Non-fat and low fat flavors are available for both. As a fro-yo homie, I find it well offensiave that yo would even compare me to that fro-milk. Not safe man. Fro-yo for the win.